NORTH ADAMS — Familiarity may or may not breed contempt. It can certainly breed lack of imagination. Photography has never been more ubiquitous. A chicken in every pot never happened — thanks to cellphones, a digital camera in every pocket or purse pretty much has. Why would anyone, including artists, feel a need to rethink anything so common and useful? Yet that very ubiquity makes fresh responses to the medium all the more useful, and fresh responses are what three shows at the Massachusetts Museum of Contemporary Art offer. “Clifford Ross: Landscape Seen & Imagined” reminds us that photography involves seeing by two parties: the photographer, and the viewer of the photographs taken. There’s nothing remarkable about this fact, except that Ross makes it so through his use of scale. Much of the show runs through March. Another portion, the “Hurricane Wave” series, runs through Aug. 30. In addition, an “immersive outdoor video installation,” as Mass MoCA describes it, will be on display most Thursday and Friday evenings between June 26 and Sept. 4. That video display isn’t the only thing immersive about Ross’s work. Simply described, “Sopris Wall I” is a photograph of Mount Sopris, in the Colorado Rockies, flanked by trees, with a small body of water in the foreground. That description, while accurate enough so far as it goes, goes nowhere near far enough to give any sense of the experience of seeing “Sopris Wall I” in person. “Wall” is in the title, rather than “mountain,” for an excellent reason. The displayed image — a photographic negative printed on wood panels — fills the entire wall of a double-height gallery. The image is 24 feet high and 114 feet wide. Its being a negative rather than positive, and the textural effect of the wood, make the image appear more like curtain than photograph, with the world behind it as stage. The sheer fact of the image existing as a physical thing may be the single most impressive thing about it. Materiality, as well as scale, encourages rethinking of what photography is — or can be. 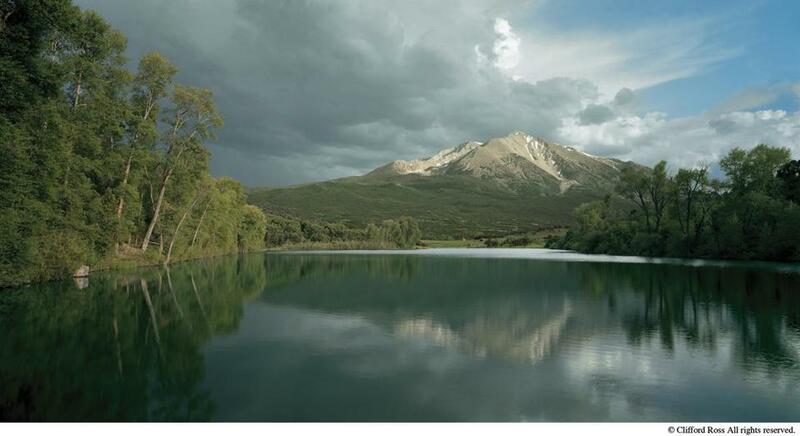 By comparison, “Mountain IV,” a positive print of Mount Sopris, looks demure at a “mere” 6 feet by nearly 11 feet. It’s like one of the enormous 19th-century landscape paintings of the American sublime by Albert Bierstadt or Frederic Edwin Church. There’s a key difference, though. Ross takes his photographs with an ultra-high-resolution camera of his own design. It’s able to capture detail with an ability surpassing that of the human eye — or “mere” human eye, to use again a word that comes in handy when writing about Ross’s work. Such detailing raises questions about the relationship between reality and abstraction. Those questions are underscored in Ross’s “Harmonium” series, where he presents a small portion of the larger image of Mount Sopris on a far more manageable scale. “Harmonium VII,” for example, is roughly 4 feet by 3½ feet. Ross also prints them with a single dominant color superimposed — red or green or yellow — so the relationship is as much between unreality and abstraction. Divorced from standard perspective and context, they resemble Chinese painting. 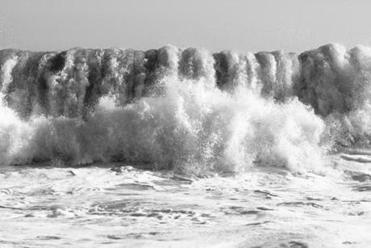 Ross’s “Hurricane” series consists of large black-and-white images of surf. It emphasizes the interplay of reality and abstraction even more powerfully. The intensity of detailing — Ross’s apparatus almost functions as part camera, part microscope — makes the images seem less oceanic than Abstract Expressionist. Turbulence becomes stasis, creating a Zen urgency — or should that be frenetic stillness? The photographs are shown apart from the rest of the show, in an old attic space, with a low wooden ceiling. Its wonderfully expressive rafters and beams are to driftwood, one might say, as Ross’s photographs are to actual surf. “If [these] ‘Hurricane’ images are successful,” Ross writes, “there should be a feeling of both anxiety and wonder instilled in the viewer. The still image should have the same effect on the viewer that the actual waves had on me.” That’s a very tall order for a mere (that word again) two dimensions to fill. It’s impressive how close these extraordinary images come to doing so. The title of “Artists’ Choice: An Expanded Field of Photography” makes plain its innovative intent. Both it and “Liz Deschenes,” the third photography show, run through April. There are six artists in “Artists’ Choice,” and it was Deschenes who chose them. Her show consists of five large freestanding wooden frames surrounding monochromatic acrylic. If Abstract Expressionism informs Ross’s waves, Minimalist sculpture doesn’t so much inform as define these works. In “Artists’ Choice,” Dana Hoey’s video installation, “Fighters,” puts the viewer in the ring with her pair of female pugilists, the video projected on all four walls. Miranda Lichtenstein has five photographs from her “Screen Shadows” series and a video, “Danse Serpentine (doubled and refracted).” For the former, she takes mundane objects and photographs them silhouetted and only partially visible behind various papers. They have a bewitching beauty far removed from the chill austerity of Deschenes’s work or, in “Artists’ Choice,” that of Sara VanDerBeek, Craig Kalpakjian, and Josh Tonsfeldt. Randy West’s gridded “Edge of the Cloud” is austere and chilly too. But in its relationship to Alfred Stieglitz’s “Equivalents” cloud studies of nearly a century ago, it connects with a photographic past in trying to use the photographic present to redirect a photographic future.